Please enter your details and create a challenger. If you have already had a challenger from the previous test, you can skip this step. Find out more about the GMC Courses. If you are taking part with your family or by yourself, please select 'Individual Sign In'. You can select a Course on the next screen. ※If you have received a School Code from your teacher, please enter it to complete registration. Find more about the GMC Plans. If you select the Standard Plan, please follow the instructions on the purchase page to complete payment. 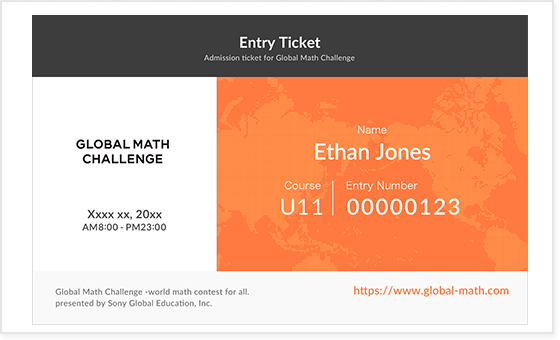 Try some sample questions - get ready for Global Math Challenge. Trying sample questions will get you into the Global Math Challenge way of thinking - and make the test day go that bit smoother. It’s also a good chance to check that your computer & browser work well so you'll be ready to go on the day. ※Please note that you cannot check computer system requirements by trying the sample questions on the front page. 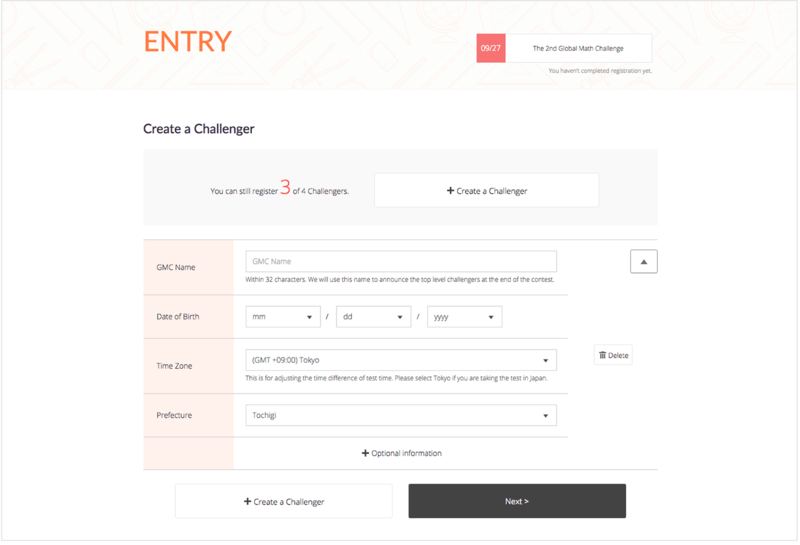 You can register up to four challengers per account. Please be sure to complete your registration before the test date. Trying sample questions will get you into the Global Math Challenge way of thinking and make the test day go that bit smoother. It’s also a good chance to check that your computer & browser work well so you’ll be ready to go on the day. * Please note that you cannot check the computer system requirements by trying the sample questions on the front page. Print out your entry ticket and get ready! Please print out your entry ticket and save the date. Pop it up on your fridge or next to your computer to keep it fresh in your mind. You can keep up to date with the latest GMC news via out Facebook and Twitter accounts too.